On January 13th 12 passengers on a bus going to Donetsk were killed in an explosion near the Ukrainian controlled town of Volnovaha. Ten casualties were reported directly and two more died later in the hospital. Both Kiev and Marie Harf of the Obama Administration were quick to put the blame on the Novorussia army saying it was an artillery strike. “Attacks on the airport of Donetsk and the shelling of the bus, which killed 10 people and injured 13 more, constitute gross violations of the Minsk agreements”, – said Harf. The problem is the nearest artillery set up in DNR is over 50 kilometers away which is well out of range. Poroshenko immediately ordered another mobilization of conscripts and Kiev tightened the blockade of Donbass by stopping bus and train travel near the war torn area. The problem for the Ukrainian and US Administration’s claim is video footage from the scene shows clearly that the area was mined. The footage was taken by Ukrainian soldiers at the scene. Further complicating the claim that this was an artillery attack is in an apparent attempt at a coverup by Kiev. This hole is what the Ukrainian government is claiming to be the crater from the shell blast. The hole itself has square edges obviously made with the shovel used to dig it. Simplifying the investigation is this image from the scene that shows a Ukrainian soldier with what appears to be a claymore mine. Claymore mines are direction anti-personnel mines that can be triggered remotely. Shown in the Vkontakte social media post below Pravy Sektor has taken responsibility for the attack saying they killed 15 terrorists and took 3 prisoners. The men, women, and children on the bus were civilians whose crime was traveling on a bus on the wrong day. The area they were traveling in is completely in the Ukrainian government’s control. This is another outrage. What is Kiev Up To? For the last few days Kiev has gone on the offensive again. In the last 24 hours Kiev has broken the peace treaty over 60 times. Incendiary shells rained down on Donetsk overnight. 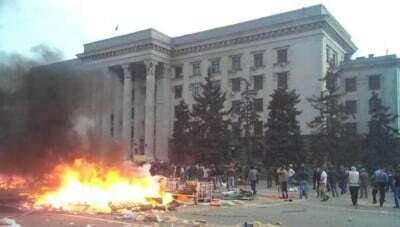 Over the previous 24 hours prior to that Kiev attacked over 40 times. Donbass forces are now on a counter offensive retaking towns Poroshenko’s forces have attacked with tanks in what is supposed to be neutral area. In a hacked document from Ukrainian SBU (equivalent to FBI) head Valentin Nalyvaichenko, dated December 25th, 2014, attacks on civilians in towns occupied by the Ukrainian army were ordered. (Note: this is in the Ukrainian Government controlled area, not in the rebel-held area.) The document states that patriotic nationalist officers were to set up temporary artillery positions and kill civilians. The reasoning according to the document is low Ukrainian troop morale. Local citizens are questioning the soldiers’ right to be there, and these citizens support the the Novorussia volunteers. Ukrainian conscript-soldiers are losing the will to continue fighting in the war. (The objective of simply killing the local residents — the people who live there — is not what they had thought that the alleged ‘Anti-Terrorist Operation,’ or ATO, was all about.) The document was not written by conscripts, who are the general Ukrainian population; it was instead written by a true-believing nazi, or fascist racist, an individual who instead represents the people that the Obama Administration (now with the full support of the U.S. Congress) had placed into power during the February 2014 coup — and these nazis’ particular hatred is directed specifically against Russians, and against anyone who supports Russia and Russians. The killing of the residents there is thus a morale-booster for the relatively few nazis who are fighting on the side of the Ukrainian Government, but not for the majority of that Government’s troops, for whom it is the opposite: very depressing to be participating in. The document stipulates that after the attacks are completed, nationalist officers were to then move the artillery positions and blame Donbass defense forces for the attack. This propaganda move is designed to enrage conscripts in the Ukrainian army against “the enemy” and raise morale needed for the offensive Kiev is now beginning. The officers would be reassigned to a different location away from the apparent war crime. The document shown above is more clear evidence of crimes against humanity by the Ukrainian government. The question is how long will they be allowed to investigate their own criminal actions, and when will the world demand justice for the people of Ukraine and Donbass?